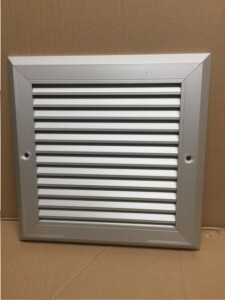 A very robust grille made from extruded aluminum and recommended for internal use only. Used when some privacy is required and yet ventilation is vital. Fixed blades are angled to stop sight from any angle through the grille but still allowing sufficient free air to maintain ventilation. 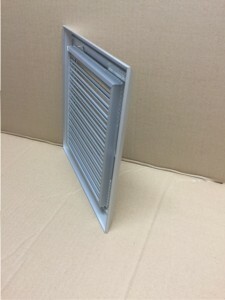 Standard finish is satin anodised. White or RAL or BS colours are also available. The NVGS is ideal for a door as its flush mounted to sit proud on the door. Our Fire Blocks can also be incorporated with these.